I saw something on the Tangents Facebook page about monitor calibration, and had a thought about it. I don't want to start a firestorm of discussion. I know the importance of a calibrated monitor. In my mind this would be of the utmost importance when you are delivering prints produced by a top-notch lab. But what about a guy like me, and the kind of work I do? In the year+ I've been earning a little cash, I have never been asked to deliver prints over the two dozen-or-so jobs I've worked. The closest it's been was when a recent client had a Meet-and-Greet with a TV celebrity, and I was asked to process the photos as if they were to be printed, but they were delivered on USB. Other than that, it's all Dropbox, Google Photos, on-line delivery. So, my faux scenario would be: I spend the time, money, and effort to get a good calibrated monitor. The colors on my monitor are spot on. But, now I am delivering those photos to a client who will only view them on a different computer monitor. The average person doesn't calibrate their monitor, and maybe things don't look quite right to them. If they ask about it, what do you say? "My friend, it's you, not me"(?). I'm not trying to be a pain, but hopefully my thought can be understood. Again, I understand the importance of calibration. Of course, the above scenario could be reversed: my monitor is out a bit, and the customer has great equipment, and things don't look right. But I think that would not be the case in most instances. Believe me, I would love a fire-breathing speed demon of a computer, with a monitor that screams "Yes, the is exactly how RED should look, and all the rest too!!". The whole idea of a monitor calibration is to precisely set it up for *print* work, as in you need to see what you are getting like White Balance, Exposure, Contrast, and how great the colours would be, if you are doing a lot of printing, but, more importantly, if/when the client prints out the digital files you may supply. You are absolutely right in that once you hand over files, the owner could view them on the crappiest monitor out there, or even a high end monitor but not calibrated with a high contrast glossy screen and think wow, or think WTF is wrong with these files, so I always explain to clients that forget the look on their computer screen, because once you go to a reputable photo lab, the prints will look amazing if you got it right. Therefore the importance is for you personally to prepare files for print and not just be a digital visual thing, although 99% of people will play the images on screen for family and friends absolutely for sure. Having your monitor calibrated to a 'paper white' tonal range around 200:1 contrast ratio is far better than having it around 1000:1 and above which looks damn fantastic with vibrancy, contrast but you are looking at a back lit LCD and it will print no where near like that if edited on such a screen. Gamers would revel in such monitors, high glossy contrast and they can see all the glorious 'bloodshed' in bright vibrant colours to their little heart's content. Edit: When clients come to my place to put up the files, and even though I may have quoted and shot the job as 'Digital Files Only', I always print out at least 6 10x8 prints for them, and show them on my monitor those prints also, and then when they get home and view them and they look different, especially if the WB is too warm or worse, too cool, they at least know the files/prints are 'perfect' as close as possibly I could have got them. Attached is an monitor calibration test image you can print out yourself to compare the print against your own monitor. It's 12x18 print. Click on it to load it then right click and Save Image As when it loads in your browser. Here is a 'step wedges' file which should show you all the various 'wedge steps' from the blackest black (0) to pure whites (255) and you should be able to distinguish between each individual step which I can easily do, that's for tonal contrast, and the Primary Colours of RGB. 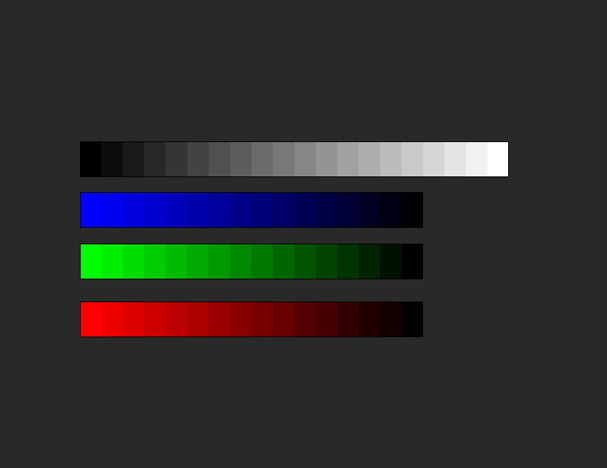 Calibration does a hell of a lot more though, it sets up the RGB/CMYK/Blacks/Midtones/Highlight values as well as Contrast, and all the steps in between. This is a little test file you can easily look at from the get go to see if you can distinguish those steps. Save the image and open in photoshop also and get the Eye Dropper Tool and mouse over each step and look at your Info Palette to check the density of each step. 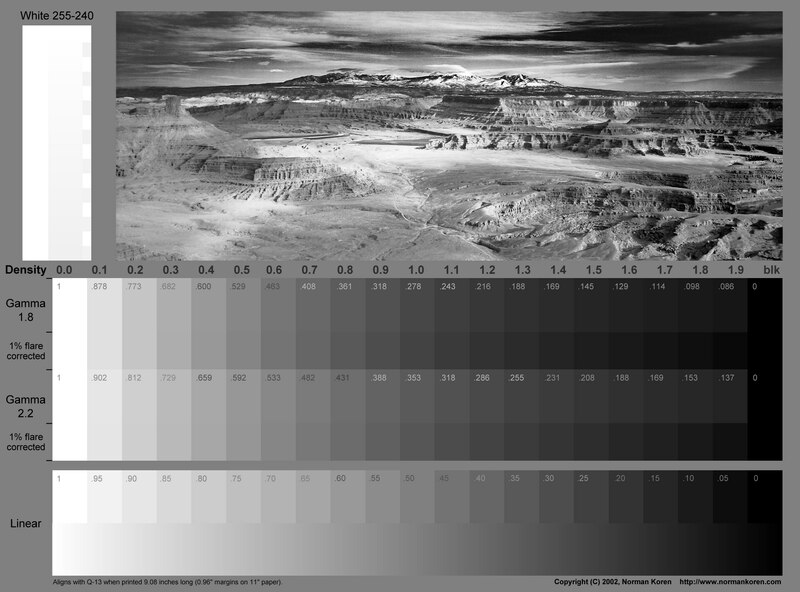 Another file for you to check out, all in mono, great for viewing your pure 'grey tonal range', you can print that also and check against your monitor. Trev - Thanks, I saw the "Step Wedges" on the FB post. So, when the one client I had who asked for files that "might" get printed out, I sent a few to the local CVS, which is a drug store in the States that most regular folks go to when having prints made. I made sure it wasn't "On the spot", because a different machine is used. I got photos, a stared at my screen and the prints for a good while, and later did the same thing. I could not see any discernible difference. Scientific? Hardly. But, it did give me a warm fuzzy that the colors and skin tones matched up pretty well. Not to digress: I am doing more conference work so a 70-200 mm F2.8 would be lovely. If my little enterprise keeps going at the current rate (2-3 jobs a month), a faster computer with a nice monitor and calibrator would be lovely. THEN, I read Neil's tips for wedding photographers, and in one he writes that he has redundant GPS units and run-flat tires. I have a 1996 Mercury on it's last legs that I swapped with my just-graduated daughter because she needed reliability. If the car craps out, why do I need all the other stuff, because I couldn't take the photos, hahahah! Monitor calibration isn't just for print work; it's for all deliverables (digital or otherwise). I write software as my primary occupation and rely on calibrated displays to ensure the images I create (Photoshop, Illustrator) are all accurate. My photography benefits from the same. For now, all my output is digital content (not print), and it's crucial to have everything be accurate. If you don't calibrate, you'll have a compounding issue. For example, you have two photographers A and B. A's display is too bright and B's display has a blue cast. A and B both send out images to a client C whose display has a green cast. C's experience with the images will be inconsistent. C is used to their green cast, but each image set provided will have a secondary issue in it. 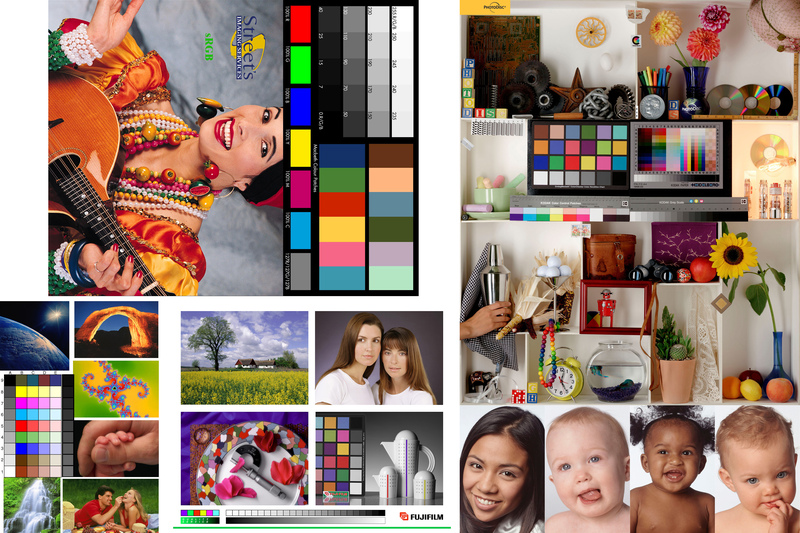 By always authoring images on a calibrated display, you are ensuring consistent work. In the above example, if both A and B calibrated their setup, then any authored image will be consistent and accurate. C would still experience a green cast, but it will be a consistent experience. And, should C every calibrate, their images would now show up exactly as intendend. Final note: print vs display output often uses different color spaces, so set up things accordingly. In my case, I don't print anything so for images in software and all photography, I rely on the sRGB color space for all output. I also shoot in RAW + JPEG (single memory slot camera and that's the best I can do for in-camera redundancy). I set the camera to use sRGB for the JPEGs. My display also can show the full sRGB space. Additionally, since the Rec 709 space I believe is effectively sRGB, this setup works well for my video work too. Thanks, rs, this is really great stuff. From your other posts, I figured you were an IT guy, and your info is another case for calibration in my basically non-print world. Now the issue is - for me - money, and what is the next priority. But I would be interested in hearing about a couple of affordable options for performing calibration, because I have yet to delve into what does what. The two primary brands are Datacolor and X-rite. e.g. check out B&H and search on Datacolor's Spyder5 line of products (ranges from USD 125 to 280). Or, X-rite's ColorMunki lineup (starting at around USD 90). Currently I use a Datacolor Spyder4Pro. What you'll need to purchase will depend upon how many displays you need to calibrate and if you also need to calibrate printers, projectors, etc. If all you need to calibrate is a single computer display, you can definitely look at the entry-level options. rs- Thanks for the info. A ColorMunki Smile is on its way from Adorama. Seemed very reasonable and easy to use.